In the January/February 2017, “Robert’s Ramblings,” I announced that Irene and I had sold the GAZETTE to Kevin and Nadean EuDaly, owners of White River Productions (WRP). I noted that Irene and I would still edit the magazine, Sharon would continue to lay it out, and American Web would still print the magazine, so you, the reader, should see little change. I hope you will agree that the magazine you are holding is little changed from the GAZETTE that you have become used to. However, there are a few small changes. Longtime readers will note the lack of our classified section, RIP TRACK. Recently, perhaps because of the internet or eBay, we have been receiving so few RT ads that we decided to stop this once popular feature. You may also have noticed that the magazine is about ¼-inch wider. This is so that GAZETTE ads have the same sizes (and shapes) as ads in other White River Productions’ magazines. 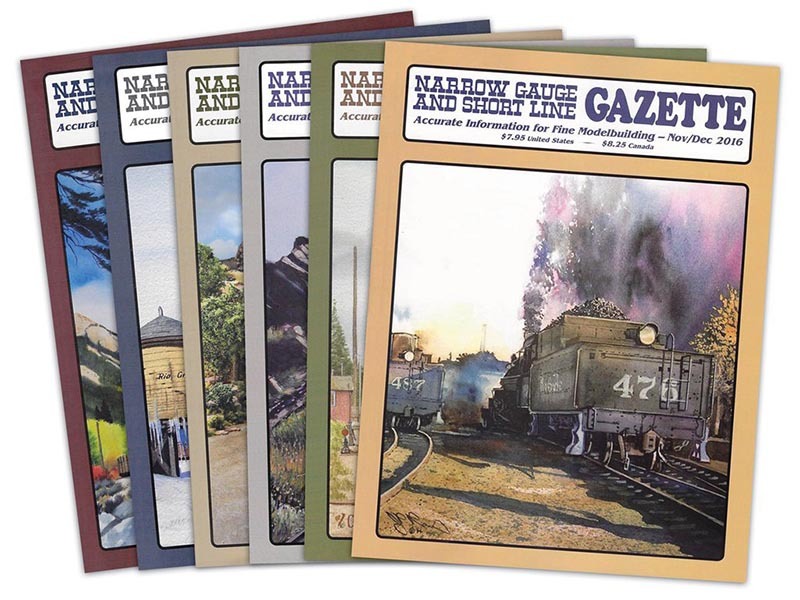 Thus an ad from Railroad Model Craftsman will fit without modification onto a page of the GAZETTE, and vise versa. Before you write, phone or email, Please make sure you check page 4 of each issue for the WRP department you want. But – as noted there – articles, letters to the editor, announcements, and products and books for review should still be sent to P.O. Box 26, Los Altos, CA 94024. It has been my custom to thank those who make the magazine possible in my March/April “Ramblings.” So here is my 2017 recap. 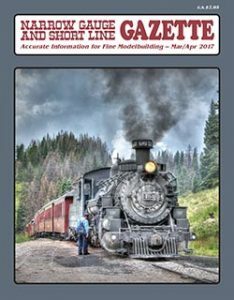 This issue begins our 53rd year (counting Finelines) of publishing model railroad magazines. Irene has kept the office running, and has copy edited and proofread almost all of those magazines. We now hope she can semi-retire, and work on her butterfly research. Sharon Olsen continues (after nearly 40 years) to make the magazine beautiful, and is now learning the ways of WRP. It was she, who resized all the ads for this issue. The folks at IMI (Information Management, International) will no longer manage subscriptions. Subscribers will now need to contact that department at WRP. Irene and I want to thank Nancy Pearsall and Hamilton Fong at IMI for their many years of help. And we, and I’m sure, many subscribers have fond memories of the late, Patience Jewell, who was just that – a jewel – at customer service, and sorting out problems. Bob McEachran, Julie Crosby, and John Headdy of American Web continue to take care of printing and distribution, and Kim Redmond of Kalmbach Publications will handle hobby shop distribution and sales. Thanks, Bob, Julie, John, and Kim! Our columnists, Charlie Getz, Jim Vail, Mallory Hope Ferrell, and Craig Symington keep interesting articles coming that perhaps even “force” some of you to your workbenches. Steve Harris is taking some time off to complete his model of Ridgway – I can’t wait to read about it. And plan makers: Gary Caviglia, Neil Pfafman, Bob Stears, John Midgley, and David Fletcher keep us on the brink of being overwhelmed with neat ideas for models. And, there are also all the other authors who keep articles coming, you the subscribers, and the advertisers who make the magazine financially possible. And, speaking of ads, please make sure you contact Mike Lindsay at White River Productions for our new ad rates and insertion order forms. Since we sold only the GAZETTE, but not Benchmark Publications, Ltd., Bob Hayden of Hayden Consulting continues to store and sell our books and DVDs. Thanks, Bob! The transition of the GAZETTE to WRP is going well, with only a few glitches, and Irene and I, thank all of you who have wished us well. Pressures around the office are lessening and maybe I can complete my 7/8n2 live-steam locomotive, JACK, and some of the projects littering my workbench and layout room. And, Irene has at least 35 years worth of butterfly data to analyze and write-up.